Create New Columns: A new column is created when you copy and paste nodes from the Node view or layer in the Timeline view. 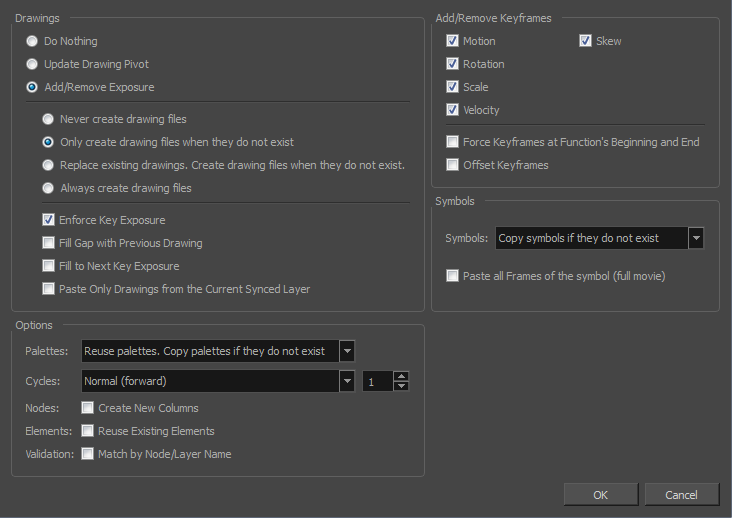 If the layers are linked to function curves, the function curves, drawings and timing will be duplicated. Match by Node/Layer Name: When pasting a template with a hierarchy onto another hierarchy, this option looks to match the pasting elements with the same layer or node name, rather than the same hierarchical structure. This means that even if the two hierarchies are different, a new pose of a character's body part will still be pasted on the correct body part layer, as long as both layers are named the same.